Ali and me participated in the 10km category and we did it just for the fun of it. We finished the race in 1:03:00 hours and we were wearing jeans. The only triathlon event I joined this year. I participated in the sprint and full distance. Ali participated in the Xterra Trail Run while Zaeidi participated in the full distance. The first Mountain Bike race of the year organized by Brunei Darussalam Cycling Federation and sponsored by Malar Setia. It was held at Berakas Forestry Reserve. 3 Categories – Downhill, Cross Country Olympic (XCO) and Cross Country Short Circuit (XCC). Not much information on this except Ali managed to win 1st place in the Novice Category. Pre Race preparation for the National Road Race. I’ve participated in the race and due to congestion at the 1st U-turn, I was left behind and didn’t managed to catch the peloton. So I rode it alone all the way until I saw them coming in the opposite direction, I joined them. So I was considered Did Not Finish the race. Johan was also doing the same thing. Managed to finish the 137km road race within the time limit and I was very satisfied with my performance. Rank 40th out of 44 finishers. 42 cyclists did not finish the race. The only National race that I joined this year. Team Time Trial organized by Belait Cycling Club (Geotrax) and held at Kg Lumut and Seria ByPass Highway. 25 Teams registered and we managed to get 4th Place. We weren’t actually trying to win the race. The strategy was not to drop any team members and I was the weaker link. I wasn’t performing well on that day. so they have to slow down the speed just for me to keep up. 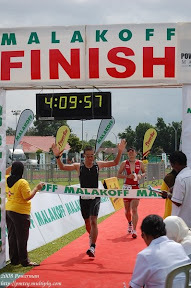 This is our 4th time we participated in Powerman Malaysia. 2 events in Sri Manjung Perak and the other 2 in Putrajaya Malaysia. This was by far the biggest achievement of the year. Ali Nordin and Johan got 3rd and 4th place respectively in their ELITE categories and for TEAM Categories we got 2nd place. We were beaten by G530 TJ just by 2.318 seconds. I was selected 1 of the 25 runners to represent the 1st BIBD CE ALAF 42km Marathon NIGHT run. All of us had 8 weeks to prepare for the Marathon and for me I have to put extra work since I didn’t do much of any kind of short or long run. For the first 4 weeks, my training program was consistent and after that due to my other activities such as BCC Team Time Trial, Powerman Malaysia and Tour de Bintan – my run was somehow affected. How I ran my marathon. Since it is not a race and I’m planning to do the half marathon run at 5:45am, I’ve decided to take it easy – run/walk strategy. From the beginning I have planned to do run/walk routine and to finish my race within 5:30 hours and my results are not that far. I believed that I can do sub 5 hours if I just keep on running because I know my fitness is good for sub 5 but since I’m doing the half marathon afterwards, I‘ve decided just to take it easy. My half marathon time was very slow. I was among the 10 bottom runners. I was still doing the run/walk routine.